Landon Proposed to Lia with a Summit Flag and She Said Yes! We print a lot of banners and flags at Banners.com, but we don't always hear the story behind them. We were very touched by the story that Landon sent us regarding the flag he purchased. Here's the story of how Landon and Lia got engaged. Landon traveled to Argentina in December with a group of climbers to climb Mount Aconcagua. They had amazing weather when they reached the summit on January 5th. Landon had been keeping in touch with Lia back home via a satellite phone and kept her updated on the progress of the group. 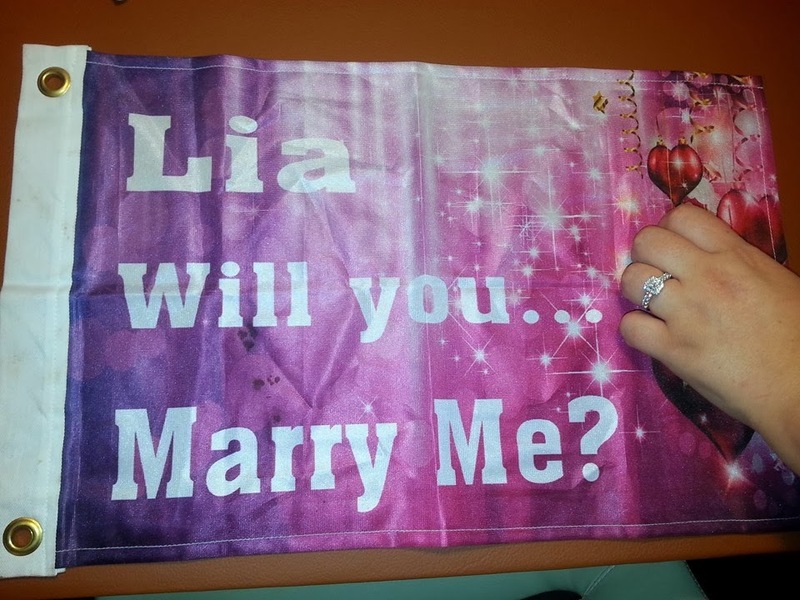 Back home, Lia had no idea about the proposal flag. Landon took several pictures at the summit of Aconcagua (22,841 feet) with the flag asking Lia to marry him. The climbers made it back down to base camp and Landon arrived home on January 11th. The next weekend Landon took Lia to Times Square in New York "just to spend some time together" since he was gone for three weeks. On the first night in New York Landon was showing Lia the pictures of the trip and telling stories about the climb. The last picture was him on the summit with the proposal flag. Once she saw the picture, he took out the flag and the engagement ring and proposed officially. Lia was totally shocked but she said yes! "I just wanted to write you to thank you and Banners.com for creating such a durable and beautiful summit flag for me. It held up to the rigorous three week journey to the highest mountain top in the world outside of Asia and still looked just as beautiful when I handed her the flag and the engagement ring in Times Square New York. I'd highly recommend Banners.com especially for mountain climbers who are always looking for a meaningful, special, durable summit flag." We were happy to help Landon with his memorable proposal and summit flag. Congratulations to Landon and Lia! If you are looking for a unique was to propose, visit our website or contact one of our customer service representatives!